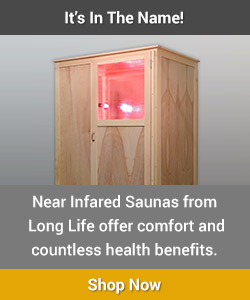 Skin Rejuvenation is a real and easy-to-obtain benefit from Near Infrared Sauna Use. It is well documented and established that specific near infrared wavelengths cause cells to increase collagen production, leading to reduced wrinkles and signs of skin aging. Plus, the profuse sweating keeps pores clean. All you need to do is simply use the sauna 5-7 times a week. First, if you can, apply a green tea product to your skin, on specific areas you want to target. A recent study showed that green tea anti-oxidants enhance the collagen increasing effects of near infrared light 5-10 fold! I would certainly recommend 3-4 cups of Matcha green tea a day. And, if you can apply green tea to your skin 10-20 minutes before the sauna, all the better. After the sauna, consume the following nutrients: 1000-2000 mg mixed ascorbates vitamin C and 2000 mg of MSM. The combination of MSM and vitamin C is amazing for hair, skin and nails. It provides critical sulfur for regenerating skin. You can expect to see results in skin texture and complexion in 1-3 months, depending on the frequency of usage.